The role of interlocking directorates in the creation and maintenance of business power elites in the United States and elsewhere, and more generally their role in the corporate governance structures of mature capitalist economies, is a widely researched and debated subject. Results on this matter would be likely to carry substantial implications in a variety of fields, from industrial organization to policy, from corporate finance to governance itself. But in spite of a massive and long-lasting research effort, the literature so far yielded relatively controversial results over the majority of the issues at stake. The starting point of our work is the hypothesis that the impasse is due to the fact that so far researchers have looked at the wrong pieces of evidence, i.e. direct relational links among people sitting in specific boards. Corporate elites are connected in much more complex ways, and power networks depend much more on members’ degrees of embeddedness in the whole network than on the local structure of board affiliations. We therefore develop an alternative approach, that we call the reverse approach, which derives interlock structures starting from actual affiliation data but exploring hidden relationships between members and constructing an alternative network representing fundamental rather than apparent interlocks, i.e. the real nature of the connection among corporations on the basis of the level of embeddedness of their board members. 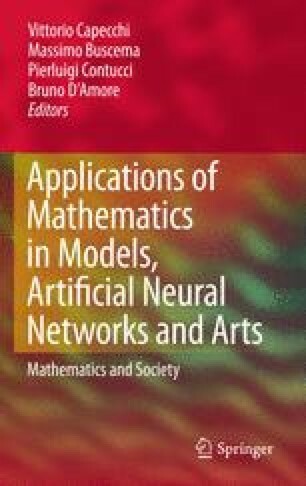 To construct this alternative, more fundamental network structure, we make use of AutoCM artificial neural networks (ANNs) (see Buscema and Sacco, Chapter 11, this volume) and explain how they can be used to develop an alternative kind of network analysis that may deliver more conclusive evidence about interlock causes, characteristics and dynamics, while at the same time avoiding the main pitfalls pointed out by the institutionalist criticism of traditional approaches.